Hello ladies! 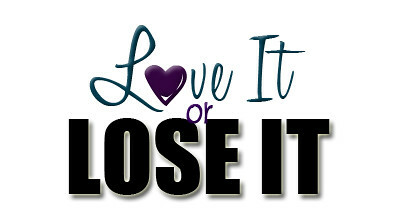 Katie P here, from Food, Wine, & Mod Podge, for the fourth and final week of Love It or Lose It! Did you get through all your items?? I saved my two least favorite items for the last week because I honestly was dreading wearing them. What does that say about those two items?? 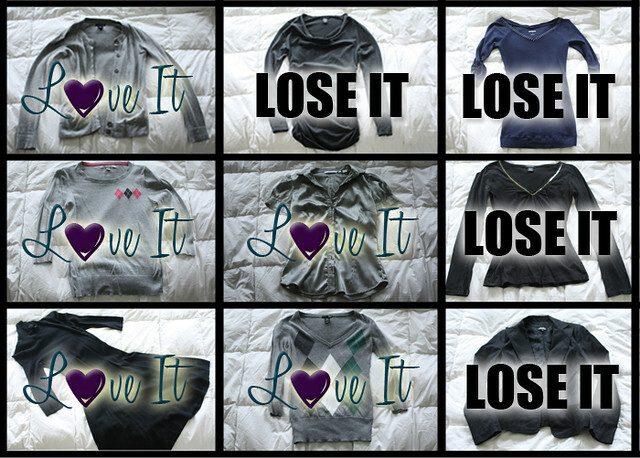 And honestly, if I was just participating in Love It or Lose It, not hosting it, I may not have actually worn them. But I promise you, I did! It's black & white satin. I like the shape of the collar. It's a really well-made shirt. I've pretty much sworn off button up shirts. They just don't fit right on my body and I never, ever feel comfortable in them. Also, this one has slightly puffy sleeves/shoulders, which never looked quite right to me. One reason I was hesitant to wear this shirt was because I live in frigid Chicago and it's hardly the short-sleeve shirt wearing season. But I put a black cardigan over it, and guess what? I actually really like it now! The cardigan covered the puffiness of the sleeves, and since it's made so well, it lays very nicely. Who knew? 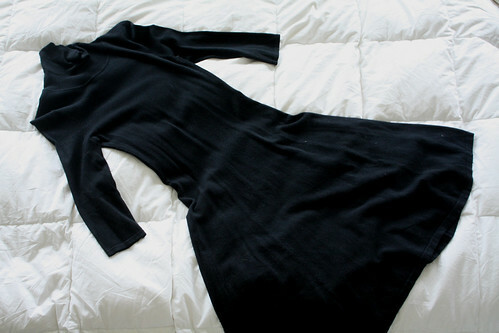 It's a cute black turtleneck sweater dress, with little belt loops at the waist. What's not to like? It flares out not at the waist, but slightly lower, so it clings a little bit at the hips. 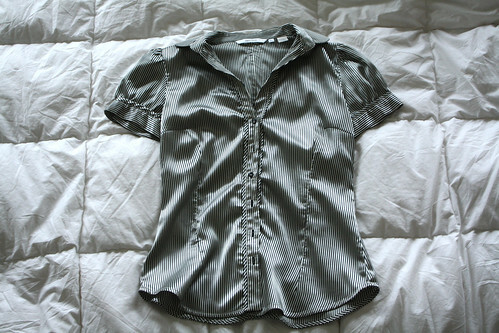 And even though I'm not a curvy person, it still emphasizes every detail. You can see in the picture, it's not quite as smooth at the hips as I would like it to be. 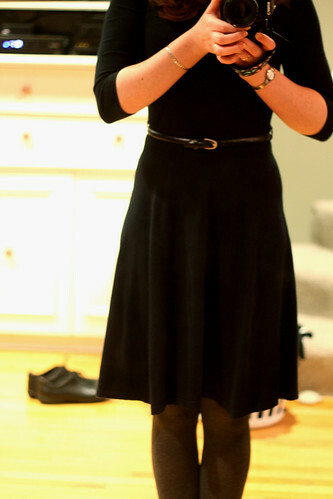 I did wear this dress all day, and though I'm not 100% convinced it's still a keeper, I'm going to hold out on it. I really believe that with a pair of Spanx, the smoothness issue can be completely worked out, and then I know I would love this. Do I own Spanx? Not yet. Did I manage to buy them before this challenge was over? No... So I'm giving myself one month. One month, and if I don't buy Spanx, I'm getting rid of it. But for now, it's getting one appeal! Considering I thought I was saving the worst for last, I'm really surprised I ended up liking both of these items enough to keep them and promise to wear them again! Overall, this was a pretty productive month for my clothes! I managed to wear 9 items that I hadn't worn in over a year, 5 of which will live to see another day, and not just in my closet, but out in the world! 4 items have lived a good life but it's time to pass them on to charity to let someone else love them. And even better, this whole challenge even got my husband to go through his closet! Bonus!! How did you wrap things up? Did you make it through very many items? Link up below, or leave a comment letting me know how many items you love again, and how many items are off to charity! I think the dress is cute! Grab some spanx (if that will make you feel better, I think you look great) ... just don't make the mistake of buying them too small - make sure they are comfortable or you won't wear them.